When you have to replace the hoses or rams on your boat's marine hydraulic steering system, air gets into the system. The air occupies space normally occupied by hydraulic fluid, which diminishes the operating characteristics of the steering system. Steering will be harder and the steering mechanism will be less responsive to your touch. 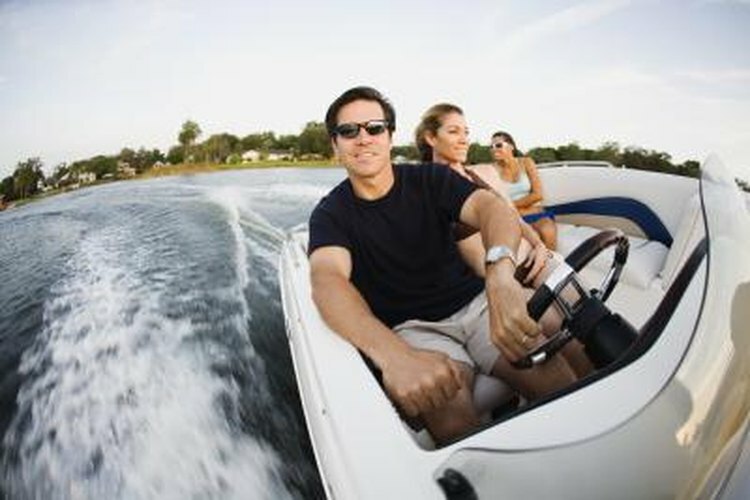 Lessen this problem in your boat's steering system by bleeding the air out of it. Top off the fluid in your hydraulic system. Locate the bleed valves on the fitting where the steering hoses are connected to the ram. Loosen the port -- left -- bleed valve on the hydraulic ram by turning it counter-clockwise. Turn the boat's steering wheel to port until air stops coming out of the bleed valves on the ram. Hydraulic fluid will come out as you do this, but when the system has been bled, it won't have obvious bubbles in it. Close the port bleed valve. Repeat the process for the starboard -- right -- valve, turning the wheel to starboard. Top off the fluid level in the system and repeat the process for both port and starboard fittings until the fluid in the system remains at a constant level. When you top off the fluid in your hydraulic system, entrained air -- air molecules trapped between hydraulic fluid molecules -- will cause the system to appear full, but as air is bled out of the system, the level of hydraulic fluid will decrease. You can keep air out of your hydraulics by adding a hydraulic reservoir to your system. This tank will provides a sealed space where entrained air can migrate out of the pressurized fluid.